In case you’ve missed it, I’ve been blogging about commonly confused tree species (and, well…commonly confuses species in general). Today’s comparison focuses on how to tell apart red maple (Acer rubrum) from sweetgum (Liquidambar styraciflua). From a distance these tree species can easily be mistaken for one another, but on closer inspection there are plenty of ways to tell them apart. When you take any plant identification class you will learn about the concept of leaf arrangement, the way leaves are situated on the plant. The two main categories of leaf arrangement are alternate or opposite. Alternate being that if you were to play connect the dots from where the leaf comes off the stem along the length of the stem, you would end up with a zigzag pattern. Opposite being that you would end up with several horizontal lines. The cool thing about finding a tree with opposite leaf arrangement is there aren’t a ton of tree species that have it. There is actually an acronym to help you narrow it down significantly: MAD, which stands for Maple, Ash, Dogwood. Of course there are exceptions to this rule, but hopefully you see where I’m going here. Red maples have opposite leave arrangement. Sweetgums have alternative leaf arrangement. 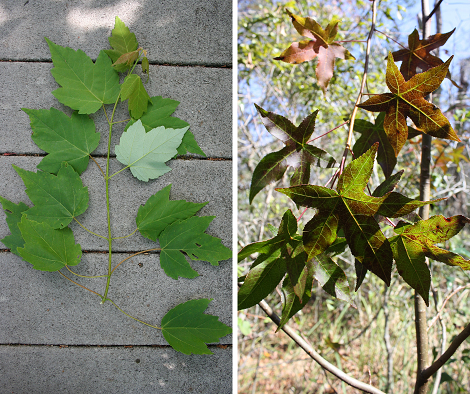 Opposite leaf arrangement of red maple leaves (left) versus alternate leaf arrangement of sweetgum leaves (right). If leaf arrangement isn’t your thing, check out the leaf margins, or edges of the leaf. The leaf margin of red maples are coarsely toothed to entire (smooth) while the margins of sweetgum are finely toothed. You can also rub the leaf in question between your fingers (as long as you’re sure it’s not poison ivy ;-)) and then smell your hands. Sweetgum leaves have a nice citrus smell to them whereas red maple leaves smell like, well…leaves (ha!). You can also note that the underside of red maple leaves are much lighter in color, almost white, compared to the underside of sweetgum leaves. You can see that especially well in the picture above. 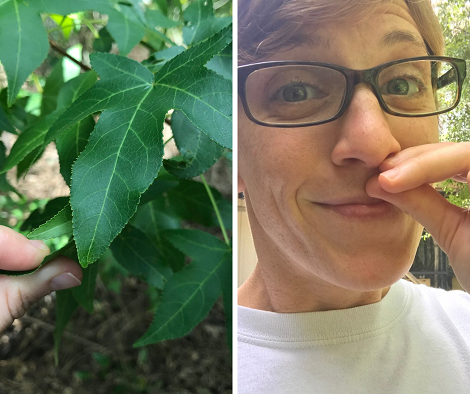 Serrated leaf margins of sweetgum leaf (left) and Lara smelling her fingers after rubbing a sweetgum leaf (right). Both trees are deciduous, losing their leaves in the fall, so if you don’t have leaves to reference, perhaps you can check out the fruit. If you have fruit in-hand, telling them apart is a breeze. The fruit of sweetgum looks nothing like the fruit of red maple. Sweetgum fruit is a round, spikey and woody ball of capsules that is about one to one-and-a-half inches in diameter. The fruit matures in late summer and persists through the fall/winter. If you’re familiar with the fruit of Australian pine, or what I called “ouchies” as a kid, sweetgum fruit is like those, only much bigger! Fruit of red maple (left) versus fruit (and old leaf) of sweetgum (right). Many of us are familiar with the fruit of red maple, but perhaps just didn’t know what tree it came from. Remember “helicopters” from when you were a kid? Those reddish-pink, winged seed things you used to throw in the air and watch them flutter to the ground? Those are called samaras and they can be a vibrant scarlet color or brown and they come in pairs. Sometimes we call these winged samaras. They are usually about ¾ inch long and appear in the spring. Unlike sweetgum fruit, red maple fruit does not persist. Instead it relies on the wind to carry the seeds away from the parent tree. Those two things should do the trick!